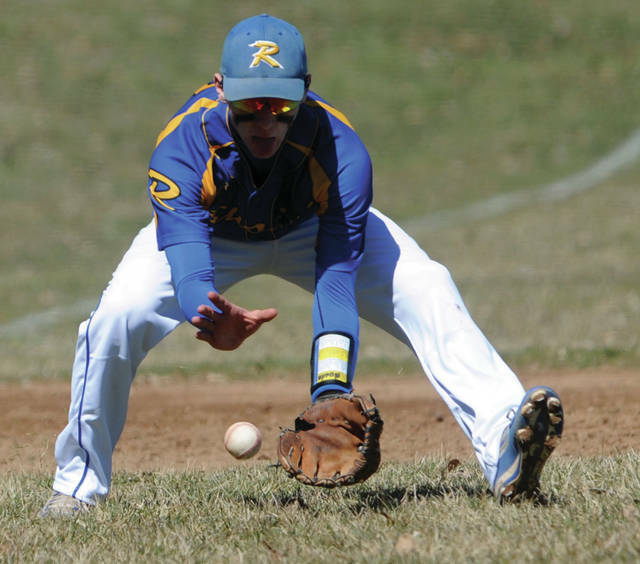 Russia third-baseman Aiden Shappie fields a ground ball during a season-opening nonconference game on Saturday in Piqua. 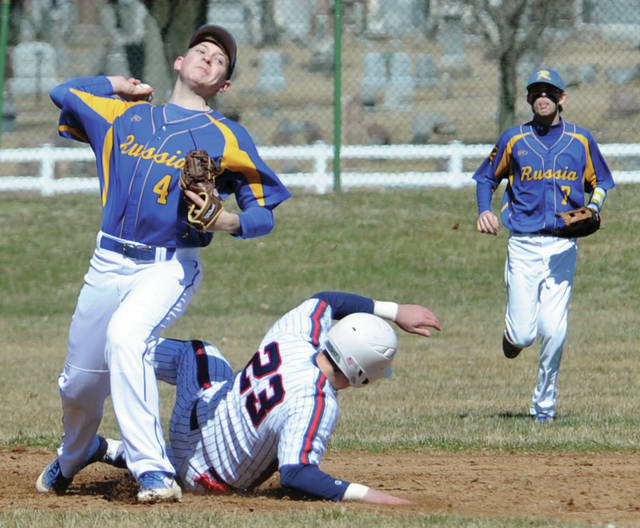 Russia’s Drew Sherman throws to first base during a season-opening nonconference game on Saturday in Piqua. PIQUA — Both Russia and Piqua’s baseball teams had their moments in a season opener on Saturday at Hardman Field. The two teams combined for 17 errors before Piqua came away with a 12-11 victory. It was not the way Russia coach Kevin Phlipot wanted to start the season. It came down to the home seventh when Piqua scored a run to break and 11-11 tie without making an out. Mick Karn singled and stole second. Owen Toopes beat out and infield single and on a throwing error, Karn raced all the way home to end the game. Russia had gotten off to a good start. Piqua committed two of its eight errors in the opening inning as Russia scored two runs. Evan Monnier scored one run on a sacrifice fly and starting pitcher Daniel Kearns had s single to make it 2-0. In the third, after a walk to Carter Francis, Monnier doubled to make it 3-0. Piqua scored 10 runs in the third, fourth and fifth — taking advantage of seven Russia errors. The Indians scored four runs in the third without a hit. In the fourth, Blane Ouhl had a double, Cameron Deal had the first of his four RBIs with a sacrifice fly and Ouhl scored when Zack Lavey reached on an error. In the fifth, Deal and Karn both had two-run singles to put Piqua up 10-3. But, Russia erased the deficit all in one inning, scoring seven times in the sixth to tie it at 10-10. The rally started with a double by Francis and Monnier had a RBI single and Justin York had a RBI double, before Piqua committed three errors to turn it into a big inning. Jerell Lewis singled in the home sixth, Ouhl walked and Deal delivered a RBI single to give Piqua the lead. “Cameron Deal really swung the. bat well today,” Lavey said. Russia tied it in the. top of the seventh when York reached on an error and two errors on Gaven George’s ground ball allowed York to score. But, Piqua was able to score the winning run in the home seventh when Karn hustled home end it. Iverson Ventrua, Ouhl and Toopes combined on an eight-hitter for Piqua, combining to strikeout five and walk three. Kearns and Grant Saunders combined on a 12-hitter for Russia, combining for five strikeouts, two hit batters and a walk. Russia will host Jackson Center in its SCAL opener Monday, while Piqua entertains Northwestern Tuesday. With both teams looking for a drastic improvement on defense.